Until recently, the Adastra Superyacht was merely a concept, with early renderings of the yacht generated numerous 'ooohs' and 'aaaaahs' from boat enthusiasts across globe. Last year the Adastra got its toes wet for the first time in Hong Kong, and has now taken the prize for ‘Most Innovative Design’ at the 2013 World Superyacht Awards. 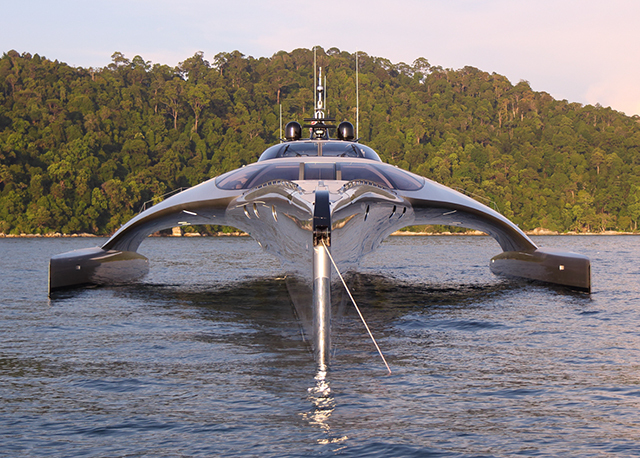 Designed by UK based yacht-maker John Shuttleworth, the trimaran is the second largest of its kind and can be controlled by an iPad from miles away from the actual vessel. Hong Kong-based shipping industry billionaire Anto Marden first commissioned construction of the Adastra five years ago. The finished product is worth $15 million, and will likely be used by Marden and his wife Elaine to sail between two islands that they own off the coast of Indonesia. Adastra is the result of meticulous attention to detail and innovative design to create a yacht that meets the needs of a very experienced ocean voyaging couple and their family, and to provide the level of comfort and style expected in a yacht of this class and size. No effort has been spared in the challenge to produce a beautiful yacht that has exceptionally low fuel consumption and yet provides excellent sea keeping qualities and luxurious accommodation. Measurements taken during the sea trials show that her fuel consumption at 10.5 knots is as low as 17 liters per hour when carrying 10% fuel and water. At cruising load (20 tonnes fuel and water) she uses just 25 litres per hour therefore on delivery trips her range is 10,000 miles starting with 30,000 liters of fuel. The slender hulls and streamlined exterior allow the Adastra to travel faster in the open ocean and at 17 knots she has a 4,000 mile range so can comfortably cross both the Atlantic and Pacific oceans at hi-speed. The challenge of turning this concept into a viable luxury yacht has led Shuttleworth to further research and develop new thinking on stability and comfort at sea for this type of craft. Extensive tank testing and radio controlled model tests in waves have been carried out to analyze stability and performance. Outrigger height has been optimized for ease of motion at sea, and a new outrigger shape has been developed to increase stability in waves. Shuttleworth and his building team have undertaken state of the art structural analysis of all the major components in the yacht in order to achieve the light weight required for very low fuel consumption. The deck and superstructure is constructed from carbon fiber with Nomex honeycomb core, the hull is glass/Kevlar foam sandwich and the interior is light weight oak cabinetry using honeycomb panels. To help reduce weight further, virtually every aspect of the boat is custom built. This includes carbon fiber hatches, toilets, port lights and ladders, which are all built specifically for the vessel.